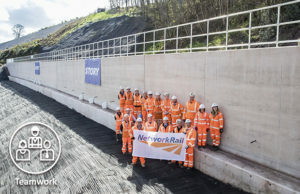 The Settle-Carlisle line reopened to train customers today after more than a year of repairs works following a 500,000-tonne landslip which had threatened the future of Britain’s most iconic railway. This section of line was shut to trains on 9 February 2016 at Eden Brows, near Armathwaite village, south of Carlisle, after Network Rail’s aerial surveillance and track monitoring teams detected the ground slipping beneath the railway towards the River Eden 70 metres below. Over the next several weeks a 100-metre section of track subsided 1.5 metres. Buses would replace Northern train services along this stretch of line until the railway was made safe and repaired. 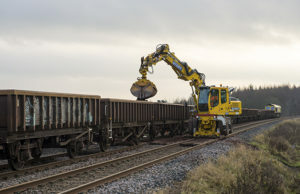 The size and scale of the repair job coupled with the inaccessible location and the fact the ground was still on the move made this the biggest repair challenging Network Rail has ever faced. 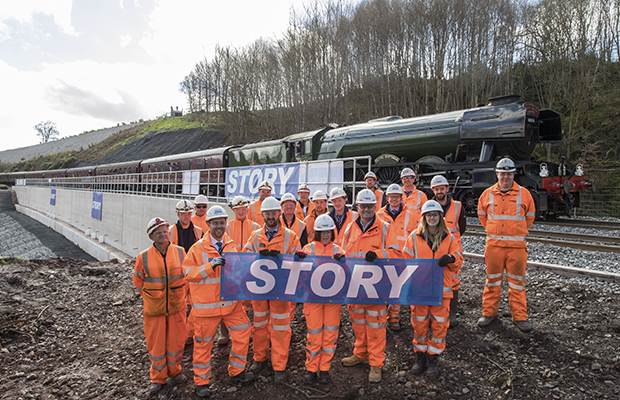 After careful deliberation engineers chose a piling solution: two rows of high-strength piles – steel tubes filled with concrete – driven into the sloping bedrock, forming a corridor upon which a one metre-thick, 100 metre-long concrete shelf has been placed. This is the solid base for the railway. After the first Northern service out of Carlisle at 5.50am today, the Flying Scotsman, hired for the day by the Keighley & Worth Valley Railway, will make a one-off chartered trip from Keighley via Settle, Appleby and Armathwaite, arriving into Carlisle at 1.05pm.